The goal of this field trip is to understand Earth’s geologic history by examining rock and sediment outcroppings as well as the landscape. The intent is to make the trip interesting, informative, and fun for all participants, including those without a geology background. 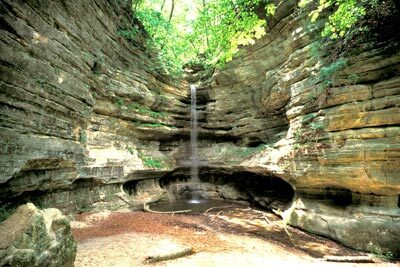 We will visit two of the most scenic and geologically interesting State Parks in Illinois, Starved Rock and Matthiessen. We will hike for a total of ~2 miles through these parks via several rugged trails, through river gorges, by waterfalls, and past dramatic cliffs. We will see the world-famous Ordovician St. Peter Sandstone, which is extremely pure quartz sandstone that is used for hydraulic fracturing (among many other purposes); fossiliferous Ordovician limestone; and a major fold, including an outcrop of dipping sedimentary rock, which is very rare in Illinois. By examining the dramatic landscape we will see evidence of catastrophic Quaternary floods associated with melting continental glaciers. We will also learn about the Indian legend of Starved Rock, the historic Illinois & Michigan Canal, and a more recent lock and dam along the Illinois River. All participants will receive a beautifully illustrated guide to the local geology called Time Talks: The Geology of Starved Rock and Matthiessen State Parks, published by the Illinois State Geological Survey. We will also visit unique Buffalo Rock State Park, which is located on a coal strip mine that was reclaimed by shaping piles of mine waste rock into large animal forms (called Effigy Tumuli). These earth sculptures are among the largest ever built. There we also will view an abandoned silica sand quarry, a Pennsylvanian cyclothem (a set of several sedimentary rocks that record the rise and fall of sea level) with Pennsylvanian shale and coal, pyrite nodules, and a major unconformity—an erosional surface preserved in the rock record. In addition, we will examine glacial till from the last two major advances of continental glaciers in North America and a Pleistocene paleosol. There will be an opportunity to collect large brachiopod fossils from Pennsylvanian limestone. During our travels, we will see a wind farm and learn how the local geology controls where most wind farms are built in Illinois. The registration fee includes: roundtrip transportation; lunch, snacks, and drinks; two field guidebooks. If you want us to provide a special meal (vegetarian, gluten-free, kosher, etc), please contact the field trip organizer at altaner@illinois.edu at least 3 weeks before the field trip event. We will leave at 8 am and return by 6pm. The trip will occur rain or shine. The trip involves a total of about 2 miles of hiking along some rugged trails and split over several stops. Please wear a pair of hiking boots or sneakers; no sandals or smooth-soled shoes for your safety. Wear clothes that you won’t mind if they become slightly dirty and bring a rain jacket. 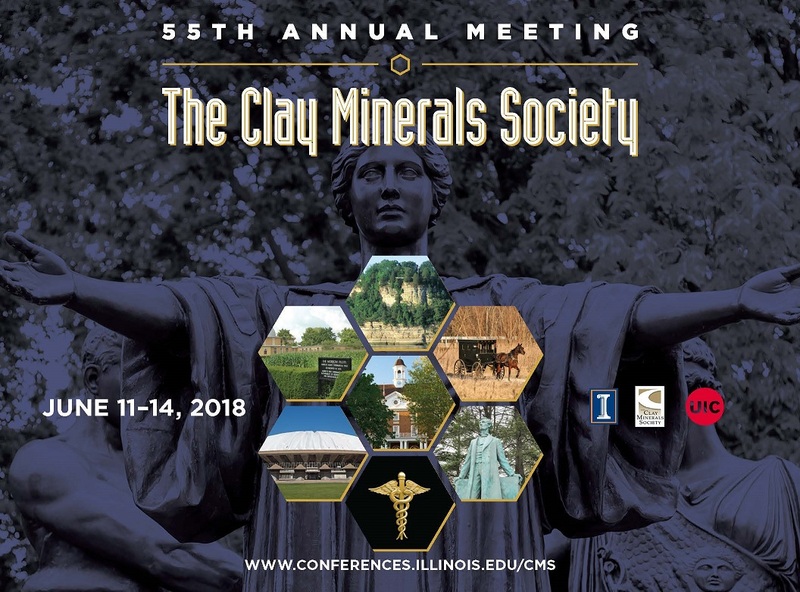 Participants in this field trip should plan to arrive by 7:55 AM on June 10 at the departure location, which is along S. Wright Street about 200 feet west of the Illini Union, where the CMS meeting is being held. 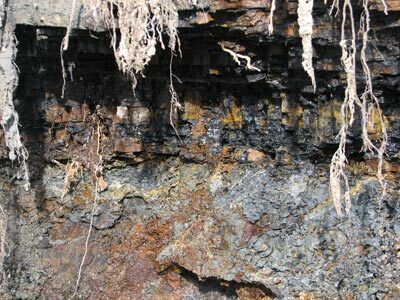 All participants in this field trip will be provided with an unusually pure hydrothermal illite sample from Ponza, Italy, described in Ylagan et al. (2000) Clays & Clay Minerals, p. 610-631. The purpose of this trip is to engage participants in understanding the origin, formation, and development of the world-famous Keokuk geodes while collecting their own geodes in western Illinois. 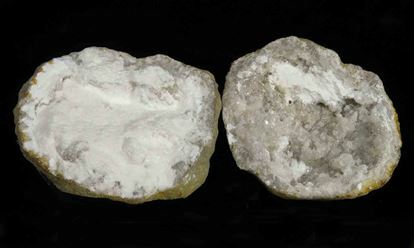 The primary intent is to collect Keokuk geodes containing kaolinite. We will travel to one location in the Mississippi River valley near Hamilton, Illinois, where the geode-bearing Mississippian-age Warsaw Shale outcrops. The Warsaw Shale is fossiliferous with common bryozoans, brachiopods, and crinoids and has variable depositional facies consisting of gray shale, siltstone, and argillaceous limestone. Geode mineralogy is highly variable across these different lithologies. At the destination outcrop, field trip participants will have hours to examine the character of the outcrop and try their hand at mining geodes to take home. We will make our best effort to provide each participant with at least one geode that contains the famous highly ordered kaolinite. Besides kaolinite, participants will have the opportunity to obtain geodes bearing combinations of quartz, chalcedony, calcite, sphalerite, pyrite, marcasite, and barite, among other rarer minerals. We will depart from the Illini Union at 7:00 a.m. and return by 6:00 p.m. The travel time is approximately 3.5 hours each way, during which we will present the geology of the area and encourage discussions on the origin and mineralogy of the geodes. We will provide guidebooks, digging and geode-cracking tools, buckets, gloves, and lunch, as well as beverages and snacks. Participants should anticipate the potential for extreme weather conditions (heat, rain, etc.). Before the trip, we will provide a list of recommended field gear. Each participant will be allowed to collect up to one 5-gallon bucket of geodes because of the weight and cost of collecting on private property. Many geodes can fit in a 5-gallon bucket and should give everyone plenty of geodes to examine and discuss their amazing finds. 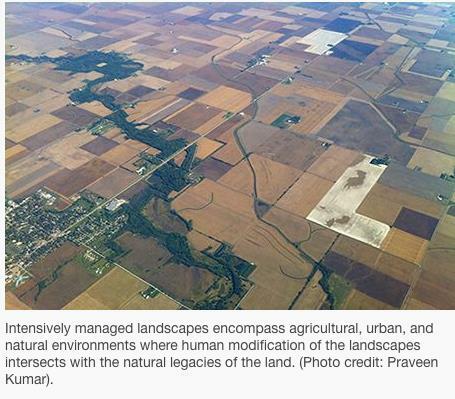 The IML-CZO consists of three core sites: the 3,690-km2 Upper Sangamon River Basin in Illinois, the 270-km2 Clear Creek Watershed in Iowa, and the 44,000-km2 Minnesota River Basin. The field trip will visit the Sangamon River Basin, which includes a broad range of variations typical of the glaciated Midwest. The basin is characterized by low-relief landscapes with poorly drained soils. The hydrological and biogeochemical cycles are strongly affected by freeze–thaw cycles and artificial drainage systems. The landscape is covered with patchy, thin loess (< 1.5 m). This basin has a poorly integrated, natural drainage network with extensive areas of poorly drained soils. Weathering profiles are relatively thin and usually grade to unweathered fine-grained glacial till within 5 m of the land surface. Soil patterns generally reflect glacial depositional patterns, except where modified by stream processes in valleys. The cost includes: 1) roundtrip transportation between Illini Union and the field sites, 2) bottled water, 3) snacks, and 4) field guide booklet. If you have any questions, please contact the field trip organizer Andrew Stumpf (astumpf@illinois.edu) at least 2 weeks before the field trip event. Field trip is run rain or shine. We will leave around 1pm and return by 6pm. The trip involves walking and light hiking. Please dress for the weather as you will be outside with limited cover from the elements. We will show sediment cores at a couple of sites, so shovels, hammers, and gloves are not required. 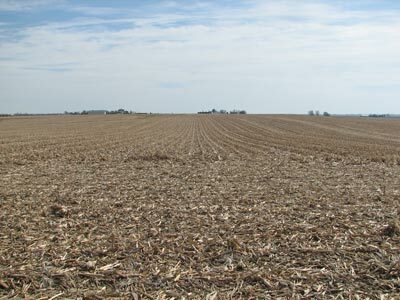 The goal of this trip is to view several interesting and important sites in central Illinois that feature clay minerals in different environments, including mudstone, soil, and glacial till in a moraine, as well as to understand Earth’s geologic history by examining a rock outcrop and the landscape. The intent is to make the trip interesting, informative, and fun for all participants, including those without a geology background. We will visit one of the type localities of illite, the Fithian illite, which is in a mudstone layer within a Pennsylvanian cyclothem (a set of several sedimentary rocks that record the rise and fall of sea level). Grim, Bray, and Bradley first studied the Fithian illite in the 1937 publication Mica in Argillaceous Sediments. Because the Fithian illite is in Pennsylvanian mudstone it contains other clay mineral “impurities” such as mixed-layer illite/smectite, kaolinite, and chlorite, as well as non-clay mineral “impurities.” We will also see other sedimentary rocks of the cyclothem including fissile shale, a 25-cm thick coal seam, sandstone, limestone, and a weakly developed paleosol. We will discuss the origin of the Fithian illite. Fithian Cyclothem including Pennsylvanian coal (upper part) and mudstone (lower part); orange color represents iron oxides from modern and ancient weathering. Another stop is the famous Morrow Plots on the University of Illinois campus. The Morrow Plots are the oldest continually used experimental agricultural fields in the USA and the second oldest in the world, after the Rothamsted Field, founded in 1843 in England. Founded in 1876, the Morrow Plots have provided important data on the impact of crop rotation, soil nutrient depletion, and fertilizer on crop yield. The Morrow Plots are located in the soil order mollisol, or prairie soil. We will learn how the K-bearing clay minerals (illite and mixed-layer I/S) can become depleted or enriched in potassium depending on the crops grown. 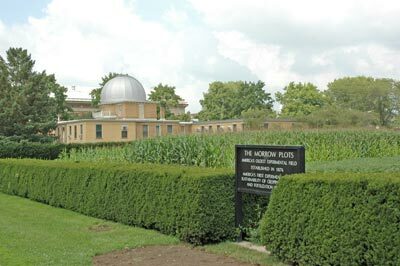 Morrow Plots on the University of Illinois campus with Observatory in background. Finally, we will visit the Urbana Moraine. It is a ridge of glacial till deposited during the Wisconsin Episode, the last major advance of continental glaciers in North America. We will learn how clay minerals are used to correlate different layers of glacial till. “Dramatic” landscape of the Urbana Moraine. The registration fee includes: roundtrip transportation; drinks; field guidebook. The trip will begin at 12pm at 3083 Natural History Building, where participants will be provided with a box lunch. Natural History Building is just east of the Illini Union, where the CMS meeting is being held. The trip will occur rain or shine. The trip involves a leisurely walk across the Univ. of Illinois campus and ~0.25 mile walk along river. Please wear a pair of hiking boots or sneakers; no sandals or smooth-soled shoes for your safety. Wear clothes that you won’t mind if they become slightly dirty and bring a rain jacket. We will provide samples of the Fithian Illite for those who want it.